A Note based on the deliberations and ideas generated in the “BW Higher Education Conclave” held at Bengaluru, on 1st September 2017. 3. Cultural factors encouraging or retarding the needed change. 1. UNESCO statistics state that India has enrolment number of 28.6 million students against the US number of 20 million and China number of 34.1 million. A good number indeed. But when you break the Indian number of students you find that of the total enrolment number, 79.87 are enrolled in the Under Graduate classes and 11.45 % in the PG; only 0.34% are enrolled in M.Phil. and 0.10 are in the Ph.D. This is a strong indication of the dismal position of research-led educational degrees in the country which stands always, in every society, in direct proportion to the scientific research being conducted in the country. India shows a big time lag in its educational achievements, and that is where we all have come here to think where to go. 2. What affects economy of the country also affects the education. What the mixed economy did to India in the sixties and the seventies in the context of development; and which perhaps was the most needed thing for a newly independent nation like India to do; it also did to education. As a result, the country rightly has the right to boast about excellent beginning in engineering education, medical education, number of institutions etc. but all under the government investment but with the happy trend of free education. This investment is paying off today in having a vast army of our engineers and scientists nourishing a global economy, which is slowly turning in favourable aspects of the Indian side. But as much as the Indian economy remained under the control of the government, so has the education administration. As a result of this, private education could not be profit-oriented; and to this day remains an area of charity, free social work or an action of altruism. As a result of this, many times professionalism and economy of such ventures suffer. e. Several connected issues of transformation and change in society that all converge on the need and result of more education, information and knowledge. 4. The great divide. The great Digital divide; Technology divide; Literacy and Education divide; Prosperity divide etc. All these divides show up in widening of disparities in the country resulting in angst living side by side of the great Hope in this great age of Anger today. 6. Assertion of the felt need of Quality Assurance, Accreditation, Ranking etc to mark, indicate and create a hot environment of competition, quality assurance and new compulsions to survive in an atmosphere of faster life style. It is also visible quite blatantly in the matter of higher education today. Student’s response to teaching carries whole gamut of possibilities and norms like questioning the cause, existence, volume of education, extant of possibilities to do more in one’s chosen field; and Research. Education is for the student and the researcher. It is all about making a student capable of crossing the Rubicon of one’s ambition or life goal. This is possible when the STANDARDS ARE VERY HIGH. So comes with “excellence” in education is the standard that our society will set with education. If our standards remain frozen for a long time, and if we do not revise our syllabi, modes of learning, interactional patterns, collaborations with other institutions of excellence and funding structures and methods, then we simply go “out of date”. Nothing in the world is worse than being called outdated! So, the first lesson lies here: GO FOR A NATION-WIDE REVISION OF SYLLABI AND RESEARCH NEEDS. 2. Finding new avenues of research; and being probing and creative in finding leading positions in our Science and Technology research. If we do not have this culture and apparatus of research, then we lag behind. Time, in the manner it is moving in the field of technology, is in utmost shortage today. Any time lag between our knowledge load and the best that has been achieved already, will put your institution down not by the measure of the lag but many multiples of that. Time lag works in its result in geometrical proportion. So, the second lesson is: BE LATEST. Revise the books, collaborate as much as possible; get, import or buy the latest knowledge posts and train our teachers to avoid time lag. 3. An excellent university selects, retains and incentivizes best teachers, researchers and students. Means are important for doing this. Let there be a nation-wide debate about how it is to be done. If there is a shortage of teachers in the country on a subject, we find ways of getting more. 4. Excellent institutions of higher education are not objects or products. They are evolving beings in an ecosystem of mutual benefit and cooperation. They have certain integral system of competence and capability of not only creating knowledge and information but also wealth. Patents, industrial inroads and collaborations, research-for-profit, knowledge production in forms of papers and books are some of the hallmarks of a productive ecosystem of knowledge and wealth. This factor of excellence in education demands a very intelligent policy response from the government and a positive attitude of civil society towards the profession of teaching. Do we rate the teachers high and give them the respect in the manner Germany and Japan does, or we treat them like salaried employees come to teach as the last resort of failures in the job market? Or have we created that situation for them? 5. Excellent institutions stand in a society that gives them full autonomy to work, to plan, to think and to execute their plan. 6. Excellence in higher education also demands excellence in education at primary and secondary levels of schooling. So, by implication, the factor that impinges upon the quality of education is a holistic way of improving education from the beginning. a. How do we rate our teachers? How do we rate them in terms of their salary, respect, autonomy in decision making and pursuing of excellence? b. How does society- including government-respond to the new investors in education by law, by new legislations and by the proposition of equality in status Vis a vis the pre-established set up of higher education. Do we make the private universities- comprising whopping +31% of the total number of universities- feel at home in status and government rules! Here, while I maintain this question, I am also aware of the fact that excellence of its own has a strength of attraction. Some private universities in the country have begun well in the quality measure of education and standards. So, given the space, private investors in education have been able to create a new environment of excellence in education. b. We have got to agree that India needs still more than 31% investment in education to make education sector as a creative and self-sustaining for-profit sector of economy as well, and not just a matter or part of residual social work. Yes, the matter of plentiful of scholarships can be made a matter of not-for-profit especially for a number of students who do not wish to avail loans. India must be open to the idea of having more university campuses of excellent foreign universities. 3. Innovation is the key of Science and technology research. Society, industry and the University together will make a network of efforts to create demand for this, so that, in turn manufacturing can be augmented. So there will have to be ways of such collaborations as will dovetail our research and development into the industrial output. 4. Quality education demands quality teaching. As I have said earlier, if we do not have enough of quality teachers we should be open to hire from other places in globalized society. No globalization is complete unless the global ethos comes closer to portals of learning. 5. Inclusion of the kind suggested above, excellence of the kind demanded of the time, and expansion of the kind envisaged in the demand of education for the burgeoning youth population in the country—are all possible only if there is collective and political will in our governments, in our administration, and in our economy. I have come across recently a paper circulated by the Yes Bank that emphasized on the term Glocalisation for quality improvement in education. This term GLOCALISATION, I think means thinking global and doing local simultaneously. You may find any number of votaries on this thought. However, we must be on guard about one thing, that the knowledge in its ultimate and eventual manifestation may not always be euro-centric. It is often said and emphasized on the name of quality excellence in teaching that the teachers are responsible for creating universal values among the students. Some modernists argue that the teaching should be value-neutral and that the teachers should most (and at least) fill the student’s mind with clarification about values while emphasizing that the facts ought to be value-neutral. But we also know that science and technology is value-neutral. Hence the only value that eventually ought to prevail is the value of unity in diversity where the world is one big family: vasudhaiva kutumbakam. आज महावीर जयंती है… एक सवाल मन में चल रहा था सुबह से ही – एक व्यक्ति जो अहिंसा की बात करता है, जिसने कोई युद्ध नही लड़ा वो महावीर क्यों कहलाया? “Education” means: to draw out that which is within you, to make your potential actual, like you draw water from a well. Education should prepare you to be yourself. Education is a bridge between the potentiality and the actuality. Education is to help you to become that which you are only in a seed form. Education should give people better ways of life, how to live more totally and more intensely; better ways of loving, better ways of beautifying existence — without any comparison with others — just for your sheer contentment. Swami Vivekananda points out that the defect of the present-day education is that it has no definite goal to pursue. A sculptor has a clear idea about what he wants to shape out of the marble block; similarly, a painter knows what he is going to paint. But a teacher, he says, has no clear idea about the goal of his teaching. Today, all education remains part of the mind; it does not make you more alert, more conscious, it simply fills you with information. It treats you like a computer. It gives you a livelihood, but it does not give you life, and it does not give you love. Our whole education system is based on giving ready-made answers. Because of those ready-made answers you never develop your intelligence; there is no need. You ask the question and a computer teacher answers them. Education is not bringing peace and silence and blissfulness to people. There is something missing in it; it is only education in subjects which do not touch your interior being at all. They may make you doctors, engineers, professors, but they do not give you the insight that can create a good human in you. Why from outside, borrowed knowledge is being forced into the minds of innocent children. You go on accumulating degrees and inside you remain empty. Your degrees can befool people, may even befool yourself, but you cannot have the joy, the blissfulness, the peace, the silence, and the compassion. And unless education has two wings, it cannot fly in the sky in total freedom. Right now it has only one wing; the other wing is missing. Why is it missing? We need an education which is nonviolent, education which is not only informative but also transformative, an education that will make you more of an individual and bring the best in you to its flowering. “Know thyself” must be the most precious education, and then you can become acquainted with everything else. One-third of our education should be concerned with livelihood; one-third of our education should be concerned with our well-being — body, health, ways to stay younger and live longer. And one-third — the last and the most important — should be concerned with love, with death, and the secrets of life itself. Only then will we have a wholesome education. And through that education, we can create a man and a society which will be healthy, youthful, loving, soulful, overflowing with joy, always ready to share with anyone — because nobody is a stranger on the earth; the whole earth is one family. An education is complete when it is inner and outer both. We have to find a human kind of education in the world; the education that exists is very inhuman. We have to find ways so that children can play in the sun and still learn a little arithmetic. That can be done — once we know that arithmetic is not so important as playing in the sun, once that thing has been decided, then we can find ways. A little arithmetic can be taught, and a little is needed. Everybody is not going to become an Albert Einstein. And those who are going to become Albert Einstein, they won’t bother playing in the sun — their joy is arithmetic, that is their poetry. Then it is different, then it is totally different; then the growth is not hindered and guilt is not created. Since last few years, I had been sharing quotes on my Facebook wall. Every quote has an originating past and a history behind it. Recently, I compiled 365 of my favorite quotes. you have helped me in learning a lot new in my life. to all teachers of my life! The only way to empower the human race is by educating them. The first word revealed of the Quran was “Iqra” – Read! Seek knowledge! Educate yourselves! Be educated. In Islam to seek knowledge is considered a sacred duty. The acquiring of knowledge is worship, reading the Quran and pondering upon it is worship, travelling to gain knowledge is worship. The practice of knowledge is connected with ethics and morality – with promoting virtue and combating vice, enjoining right and forbidding wrong. This is called in Quran: “Amr bil-l ma’ruuf wa nah-y ani-l munkar”. It is obligatory on every Muslim, male and female. at a mass level, he declared it compulsory immediately after the establishment of the first coalition government at Madinah. It was in the very second year of the regime that his law regarding compulsory education began to be implemented. His companions followed him in laying emphasis upon education. It is also on record that some of the Prophet’s companions visited Malabar in India even during the Prophet’s lifetime and spread education in that part of the land. They didn’t only strive for primary but also higher education, and established a number of internationally reputed seats of learning there. guided by the principle of -Totality. A lot of efforts are made even today but somehow the totality is missing. Since I am not a specialist in the field, I have no intention of discussing individual education methods or the various aspects of the educational system that require reforms but will like to speak on the big concern of missing the Concept of totality. image. To take an immediately apparent example, I might cite the human body itself in which the head, hands, torso, legs, internal organs and all individual cells are intimately intermeshed to form the whole. And we cannot overlook the connection between the physical and spiritual. and vice versa. The education we are spreading today is an education in piecemeal. We are forgetting that an educated and informed person who does not know the connections among things differs from a dictionary only in that he eats and the dictionary does not. We all know that the future depends, for us, on education. We know also that this education, to be of any avail, must extend through all degrees, from its lowest and humblest applications, up to the highest and most disinterested grades. We must have technical education and we must have a higher research also. We must have education of women, as well as education of men. We must have secular education, as well as religious. And, almost more important than any of these, we must have education of the people, and for this, we must depend upon ourselves. Education separated from society can have no vital force; likewise, there is no future for a society that forgets that education in totality is its true mission. Education is not a mere right or obligation. I believe education in the broadest sense is the mission of every individual. To awaken this awareness throughout society must be the highest priority. If a religion is worthy of the name, and if it is one that can respond to the needs of contemporary times, it should be able to nurture in its followers the spiritual base for becoming good citizens of the world through education in totality. The crisis of education is a crisis of life. The crisis we face today strikes at the very roots of education and learning. And yet it is in education and learning that we will find the doorway to the future. I request that we accept responsibility for the future of humankind. 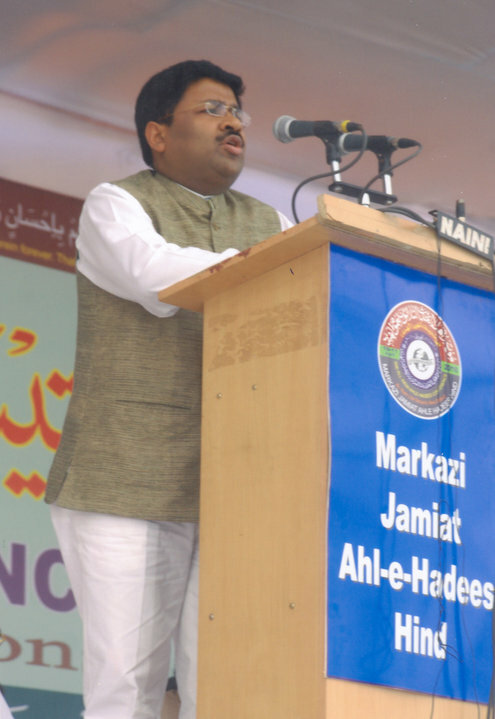 From the bottom of my heart, I ask the members of Markazi Jamiat Ahl-E-Hadees Hind to do all within their power to make fine whole human beings of our youth. I shall conclude my remarks by expressing my hope for and pride in the part that the Prophet’s Companions played for humanity by spreading education of love, peace and empowerment.